There’s an artistic simplicity here. It looks like John drew the outline of the map without lifting his pen off the paper, which is an achievement upon itself. Aside from the odd little peninsula up near Massachusetts, I’m more curious about what’s not there than what is. For example, what’s the concavity where Arizona and New Mexico should be? Did John secede them them to Mexico? At first when I looked at this, I thought that the “Go Purdue!” was pointing to an entire area that represented Purdue. 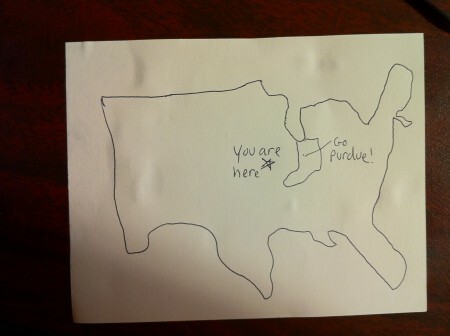 Now I see that John chose one state to draw–Indiana–because it contains Purdue. As for who “you” are, we can only guess. Based on the geography presented here, “you” is someone living on the border of Missouri and Iowa. Someone should probably tell him that he just got mentioned on this blog. Got a map of the US for me? Not yet? Sit down with a beer and a pen this evening and watch the magic happen. E-mail it to jamey.stegmaier@gmail.com. This entry was posted on Sunday, September 26th, 2010 at 10:42 pm	and is filed under best US maps, contests, humor and tagged with best US maps, humor. You can follow any responses to this entry through the RSS 2.0 feed. It seems to me that John has drawn a very complicated map whereby size is drawn relative to an area’s own perception of their “self-worth,” thus Florida and the Cape Cod area are dramatically larger than they would otherwise be. By this logic, Michigan is clearly struggling with an identity crisis as their iconic “mitten” has transformed into a giant misshapen blob (I’m sure this is related to the collapse of the car industry). The only real question that remains is where does Indiana find its overwhelming confidence, especially given its relative uselessness? I believe New Orleans is also getting a lot of attention. Maybe the news media can be thanked for that focus. Can’t wait to see more maps and see more commentary. Oh! That’s my cousin! He just had a baby (well, his wife did, you understand), but I’ll let him know. He’s sort of, you know, in the new baby out of the loop mode.